A homemade hornet spray uses all natural ingredients. Hornets are small insects that come in several different varieties. The most common form of hornet in the United States is the bald-faced hornet, which is an ivory and black wasp that is larger than typical wasps. Hornets usually stick to their own business and will only attack humans if they feel threatened. 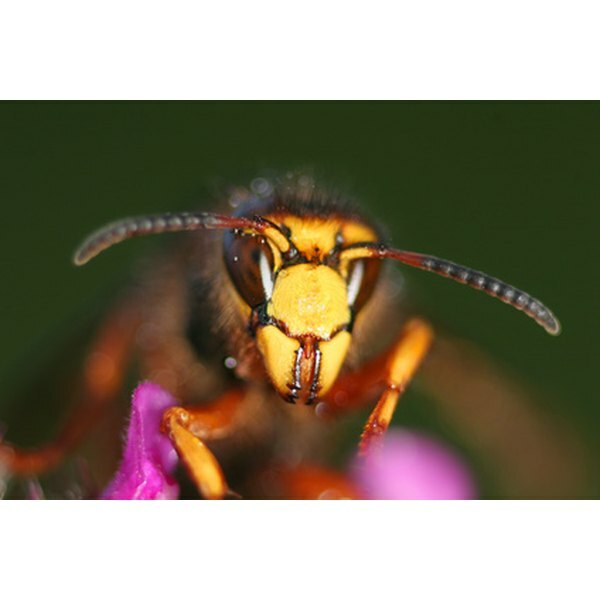 However, if you have a large nest of hornets that live on your property, the chances of the hornets feeling threatened increases due to their proximity. A homemade hornet spray is a natural way to deter hornets. Peel the garlic bulb and throw the casings away. Chop each garlic clove into small pieces. Place the pieces in the bowl. Chop the onion into small pieces and add to the bowl. Add 1 tbsp. of cayenne pepper and 1 qt. of water to the bowl. Mix the ingredients thoroughly. Pour the mixture into a blender. Puree the mixture until all of the garlic and onion pieces are eliminated and the mixture is smooth. Add 1 tbsp. of dish soap to the mixture and stir with a spoon. Pour the liquid into a spray bottle. Spray the mixture over hornets to cut off their breathing mechanisms and kill them quickly. The liquid will keep for one month if stored in the refrigerator. Take extreme care when killing hornets. If you squish a hornet the body releases a pheromone into the air which can attract nearby hornets. The hornets can sense that the other hornet was killed and will come prepared for battle. The best way to prevent hornets is to keep foods that hornets like to eat sealed away. Keep pet food, trash and other food substances sealed away as much as possible. Do not leave food out for extended periods of time. If you kill a hornet outdoors, leave the body to deteriorate naturally to prevent attracting other hornets. Remove any hornet nests at night. Spray the liquid onto the nest and prepare to run away if necessary. Wear a face mask and thick clothing to protect your skin as much as possible from hornet stings. Do not attempt to kill hornets if you are allergic to their stings. Can You Pre-Shred Carrots the Day Before Making Carrot Cake?